In January 2010, Andrew Parker wrote a post called the Spawn of Craigslist. 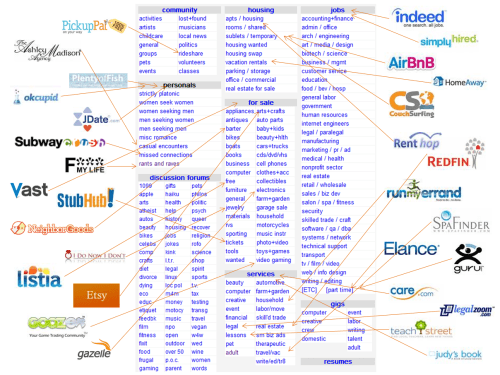 Andrew identified companies that had built businesses by unbundling Craigslist. The vacation rentals link gave rise to AirBnB and HomeAway. Etsy dominated the arts and crafts for sale. This same unbundling is occurring to Excel. Microsoft Office has more than 1 billion users globally. Assuming a 33% penetration of Excel, that’s a user population 300M users. Like Craigslist in the consumer world, Excel became the tool for nearly everyone to get stuff done at work. Need to calculate? Excel. How about a task list? Excel. How about a lightweight CRM to manage customers? Financial model? Waterfall chart for project management? Simple dashboarding/charting tool? Data exchange format between a supplier and a buyer? Light ETL tool for moving data around an organization. The list goes on and on. For millions of people, Excel is the first exposure to the power of a computer to manipulate data, calculate, and share the results. Excel’s key advantage is its product design. Excel enables simple progressive discovery. A user’s first experience is typically a quick calculation. Then perhaps adding a few rows, then a few worksheets. But pretty soon, a procurement person might be managing different quotes to buy desks. And then, they might ask how they could automate analysis in which case the could use VBA, Excel’s programming language. Then there’s the entire function library, a sophisticated data and analysis toolkit, the charting. Excel has done a phenomenal job educating hundreds of millions of people about the power of software. Startups are taking advantage of this newly data-literate user base and carving out individual applications, replacing Excel with dedicated workflow that’s optimized for a particular function. This unbundling of Excel occurs primarily within medium business portion of the SMB segment. After a company reaches a particular scale, teams grow and specialize, collaboration becomes more important, and so does control. This evolution in a company’s needs creates an opportunity for dedicated workflow software to replace former Excel use cases. These startups benefit from fast sales cycles because the benefits of a dedicated tool over Excel are clear and quantifiable. At some point, the Excel workflow becomes unwieldy and burdensome, and the software buyer feels the pain every day. So if a new company comes calling with a tool to solve that workflow issue, the buyer is ready, educated and motivated to relay the 16 digits on their credit card to solve the problem. Consequently, these companies lend themselves well to inside sales models with very short sales cycles. I wish there were a list of all the Excel use cases so I could create a parallel graphic to Andrew’s, but unfortunately there is none. Nevertheless, the universe of opportunities for unbundling Excel is enormous, and a big trend in workflow software.